Hamas is an offshoot of the Muslim Brotherhood and, naturally, follows the doctrines and ideologies of the main figureheads of this corrupt and destructive organization. From the core doctrines of al-Ikhwan is taqreeb (nearness and closeness) with the Raafidah Shi'ah. Ismael Haniyeh is senior political in Hamas and Khaled Mashal is also a high-ranking political leader. 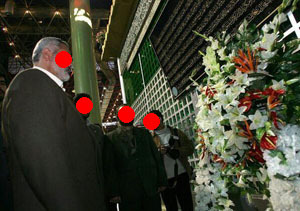 Below are two pictures where both of these Ikhwanis are found at the wathan (idol) of the pagan idolator Ayatollah Khomeini. 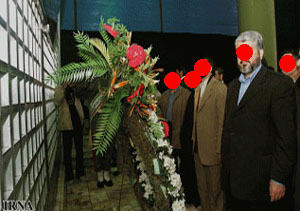 The picture on the left shows Ismael Haniyeh and the one on the right, Khaled Mashal. They are paying respect at the tomb of kafir, mushrik who said that when he conquers Madinah, he will pull out the "two idols" of Abu Bakr and Umar (radiallahu anhumaa) and who describes Aa'ishah (radiallaahu anhaa) with a despicable description - may the curse of Allaah be upon his likes. This is the ideology of al-Ikhwan al-Muslimeen, it is the extremist, extremist Irjaa' of al-Jahm bin Safwaan towards the Rafidah, Qubooriyyah and on the other hand it is Kharijiyyah against the scholars and rulers of Tawhid and Sunnah. Finally, the Raafidah and the Ikhwaan (representing Rafd and Khaarijiyyah respectively) are enemies to the people of Tawhid, Sunnah and Jamaa'ah. They both collaborate and cooperate with each other, pursuing the doctrine of taqreeb (closeness, nearness) to pursue their agendas. When you research into early Islamic history and learn that the activities of the Sab'iyyah against Uthmaan bin Affaan (radiallahu anhu) - (in which they raised those slogans of "freedom", "justice", "equality") - these activities were directly responsible for the emergence of the first two sects in Islaam, the Shi'ah and the Khawaarij, you will then start to understand the various slogans of these people of "Haakimiyyah", "Imaamah", "Social Justice" and what they really intend by them, and it will then also start making sense to you how the names of al-Khomeini, Qutb, Mawdudi and Hassan al-Banna are mentioned together. The Ikhwan do not intend the freedom, justice and equality afforded by the Tawhid of the Messengers, but they mean something else. We see them oblivious to the worship of idols by millions in their land of Egypt and at the same time they make allegiances and alliances with the Pagan Magian Rafidis of Iran. Both the Raafidah and Ikhwaaniyyah have designs on the Gulf countries which by and large represent Tawhid and Sunnah. There is no doubt that the presence of the Raafidah and Khaarijiyyah in these Gulf countries is used and will be used to cause dissension and to weaken (or destroy) the light of Tawhid and Sunnah - may Allaah protect the lands, rulers, scholars and subjects of these lands from such evil.